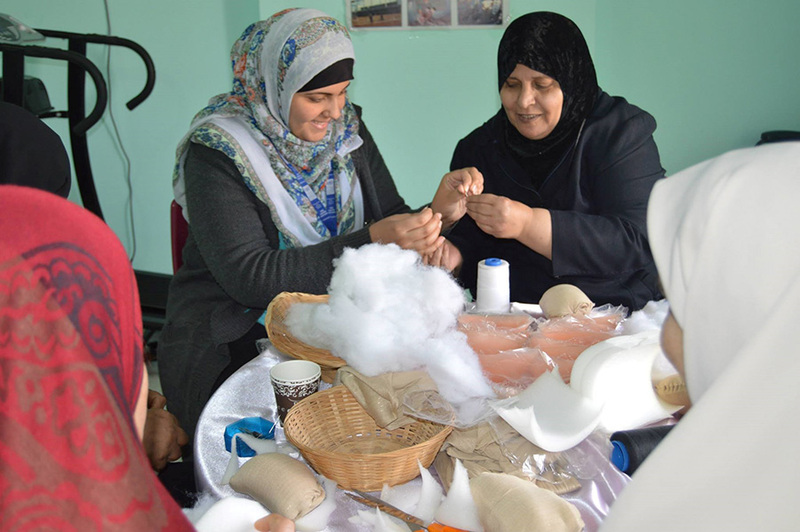 Shahd El-Swerki (left), national UN Volunteer Communications Assistant at UNDP Gaza, visited a cancer care centre and joined women volunteers in sewing breast prosthetics, which are distributed for free to female cancer patients. Volunteers are the thread that binds communities together. By sharing knowledge and skills, they enhance community resilience, bolster economic development, and build global networks. The United Nations Volunteers (UNV) programme contributes to peace and development through volunteerism worldwide. It works with partners to integrate qualified, highly motivated, and well-supported UN volunteers into development programming and to promote the values and global recognition of volunteerism. In the State of Palestine, 52 UN Volunteers – 30 of them Palestinian nationals – have been serving during 2018. They were on assignments with the United Nations Development Programme (UNDP), UN Relief and Works Agency for Palestine Refugees in the Near East (UNRWA), Office for the Coordination of Humanitarian Affairs (OCHA), UN Children's Fund (UNICEF), UN Population Fund (UNFPA), UN Office on Drugs and Crime (UNODC), UN Educational, Scientific and Cultural Organization (UNESCO), UN Women, and the Office of the High Commissioner for Human Rights (OHCHR). Bringing specialized expertise and skill, these UN Volunteers serve as education officers, community development officers, and geo info system officers, among others. UN Volunteers encourage the spirit of volunteerism throughout the State of Palestine and can always be counted upon to provide critical assistance during times of emergency and adversity. Within the context of the Palestinian economy, volunteerism creates a framework for development that is based on a collective will to progress rather than dependence on economic incentives – a scarce commodity when economic stagnation occurs. The framework ensures that all members of society have the opportunity to utilize their skills to increase their own resilience and improve their livelihoods. The UNV programme was established in 1994 in the occupied Palestinian territory. It is based in East Jerusalem and hosted by the United Nations Development Programme/Programme of Assistance to the Palestinian People (UNDP/PAPP). Since its inception, UNV has been instrumental in responding to the needs of Palestinian society. In order to create this framework and a culture of volunteerism, governments and other stakeholders need to endorse this service and provide non-economic compensation to volunteers. They can strengthen volunteerism in two ways: 1) by nurturing an ecosystem for effective volunteering; and 2) by forming partnerships that value the community’s own contributions. These efforts will ensure that localization processes under the 2030 Agenda build on the commitment and innovations of citizens everywhere. Local volunteerism must be included in national policy planning and promoted by mainstream development strategies. All community members, each with his or her particular capacity, have a responsibility to give back in order to develop and support the resilience of the community in which they live. And it is up to institutional stakeholders to build an enabling environment for volunteerism and direct the capacities of volunteers. In this way, Palestine can turn o’uneh again into the impactful development tool it used to be. Every year on December 5, the world celebrates International Volunteer Day (IVD) to recognize volunteers worldwide. A special focus is on local community volunteers who contribute to making their communities more resilient against natural disasters, economic stresses, and political shocks. Local volunteers, 60 per cent of whom are women and marginalized groups, embody the values of volunteerism and are acknowledged on IVD for their contributions to building more resilient communities. This International Volunteer Day, join UNV in celebrating the contributions made by volunteers in all walks of life. On this occasion, UNV in the State of Palestine will be launching a one-year campaign with the theme: Volunteers Build Resilient Communities. This article first appeared in This Week in Palestine.